Tea Time – Page 2 – Photojimsf!!! Ladies and gentlemen I’ve had the distinct honor and pleasure to meet a small group of mythological creatures from the Himavanta Forests surrounding Mount Meru. In case you didn’t know, that’s pretty close to the center of the universe in Hindu and Buddhist cosmology. I found them hanging out in the gardens at the Erawan Museum, and was so tickled to have them pose for portraits, which I’ve posted in my new Idol Garden photo adventure galleries. A gigantic three headed elephant sits atop the temple. Inside are housed priceless cultural icons and antiquities from several Southeast Asian religions. The place was founded by the same eccentric millionaire, Lek Viriyapant, who also built the truth sanctuary in Pattaya. You can actually climb up inside the elephant, there’s a Buddha shrine in it’s belly, and slightly above there’s a lookout. Unfortunately no pictures allowed inside the temple and museum. But there’s plenty to see in the surrounding gardens. Chinese heaven-geese, elephant-lion-horses, elephant-fish, human-swans, and other mythical creatures can be found in this unique museum and gardens in the Bangkok suburb of Samut Prakan. A worthwhile stop while in Bangkok. By the way it’s half price after 5 p.m.
Take the BTS Skytrain all the way to Bang Na station, and then take a bus #25 or #511 straight to the entrance of the temple – only about 3 – 5 km from Bang Na station. Also, there’s tons of taxi’s waiting at a stand downstairs from the Bang Na station. If you can, show a picture of the three headed elephant to the driver. I had a disastrous ride when I went, because there’s another Erawan Shrine way on the other side of Bangkok. The one that got blown up last year. It’s a four headed Buddha. The drivers know the three headed elephant Erawan by it’s Thai name, Chang, which means elephant. It can be seen from miles away so the guy instantly knew he was way off track when I finally got my uncooperative mobile phone to bring up the image. 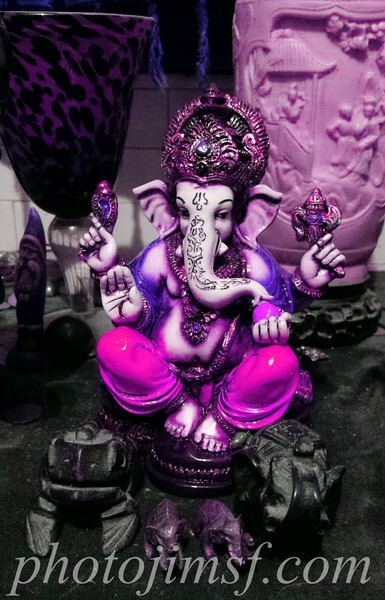 This is my delicious purple version of a Ganesha statue I ordered from Amazon. It’s presiding in a place of honor in my elephant shrine. Oh look! There’s a skinny old Santa lurking in the background on the left. Thanks to the amazing Samsung Galaxy S4, I also created green, blue, and orange versions of the same original image. They’re the first group of images to appear in my new “Idol Garden” gallery on Smugmug. I’ll be featuring more images of Ganeshas, Buddhas, garden gnomes, gargoyles, cigar store Indians, and other mythical creatures I’ve encountered in my travels. PS — More about Ganesha, Lord of pleasure and no worries, on Wikipedia. PSS — There are affiliate links to Amazon, and Smugmug on this page.